In this interactive workshop, you’ll learn how to launch a coding program in your library that will promote digital literacy and impact your community. Over four weeks, you’ll get an understanding of how to run computer programming courses that will introduce your patrons to new career paths and technologies. We’ll give you the tools you need to create library programs around coding languages (e.g. HTML, CSS, Python), career development software (e.g. Adobe Creative Suites, WordPress), and early learning (e.g. Scratch and robotics) without having to know how to code. We’ll explore all facets of building coding programming for your library such as making your case for funding, hosting Code Clubs and Hackathons, and curating free resources and technologies available online. The course will include interactive sessions with library and industry experts will help attendees map out a blueprint for developing a coding program that fits within a variety of budgets and crosses a spectrum of patrons ranging from children to adults. Librarians, educators, and those developing tech-oriented programming for the community, from early learning professionals and media specialists, or those interested in facilitating tech activities will benefit from attending. Participants will walk away with tools to fuel programming and tech-oriented planning. Now available! A separately bookable Week 1 primer. Sign up for the Week 1 primer and get full access to the first session on February 28th from 1:00–3:00 PM ET. Attend the live session with Q&A and chat with peers and speakers. 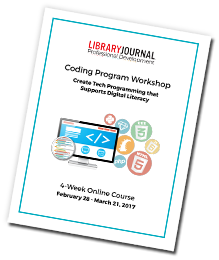 You’ll learn how to make the case for a coding program and receive expert advice on how to get a program off the ground in your library. In this archived webcast, tween/teen programmer Megan Emery shares her experience with a coding program called Let’s Code Together at Chattanooga Public Library in Tennessee and provides an overview of the upcoming Coding Program Workshop. In this insightful opening session of Coding Program Workshop, Brook Osborne of Code.org will touch on the current state of coding education in the U.S. and what initiatives like the Computer Science for All might mean for schools and libraries. She’ll give you tips and resources to use when getting your library’s stakeholders on board to build out your program. SESSION 1: Break the Code: What Coding Program Does Your Community Need? In this session, you will learn how to assess what types of coding programming your community or school needs from your library. You will learn methods to survey and review your library patrons’ needs to determine demand and create a master plan for launching an engaging program. There are many coding resources online, and sometimes choosing the right ones to use can be overwhelming and even daunting. In this session, you will get reviews of several of the best free online resources to get your coding program off the ground. From video tutorials to online classes, we will share accessible tools on the web that will advance your coding program’s content and range. General Assembly is working with government policymakers to create opportunities in tech, with an emphasis on STEM initiatives that support diversity and access to tech careers. In this session, you’ll learn the programs General Assembly offers and how you can apply them to your computer science programming. In this session, you’ll learn from Colleen Macklin co-director of PETLab (Prototyping Education and Technology Lab), a lab focused on developing games for experimental learning and social engagement. She’ll explain why making games teaches systems thinking and empathy, and how games are a fun gateway to learning code. She’ll also show you how to make games with just a little coding experience. littleBits – often described as electronic LEGO – makes it easy for students to create inventions and develop computational thinking skills. Design Lead, David Sharp, will talk about how littleBits can help students learn key coding skills while bringing the physical and digital worlds together. Prenda.co has been implementing Code Clubs into libraries since 2013 with a hybrid learning model using online resources, in-person meetings, and gamification. Through Code Clubs, students learn how to write their own code, creating animations and video games. In this session, you will learn the ins and outs of Code Clubs and how to get one started at your own library. Engage your community, nurture collaborative learning, and empower patrons with tech gatherings. Through coding events, including hackathons, Hour of Code events, and Coding Workshops, your library will create opportunities to code in a fun, exciting environment that entice new and existing library members. In this session, you will get the big picture of one-off events, learn best practices, and discover the power of these collaborative gatherings on your community. As a teen services librarian, Matt Lorenzo develops creative programming to keep his teenaged patrons engaged and learning new things. With his program CUHacks, an overnight hackathon for teenagers aged 14–19, teens put their engineering, robotic, and computer programming skills to use. In this session, you’ll learn how to run a hackathon in a library and how impactful that can be on a community.